The Marine Room has won 100+ awards for our view, including Open Table's 100 Most Scenic Restaurants in America (2011-2017), AAA Four Diamond Rating (2013-2018), and 73 Awards since 1996 including Most Romantic, Best Special Occasion, Best Chef, Best View, and Best Service from San Diego Magazine. Although we are honored and thankful for such acknowledgments, our true critics are our guests. 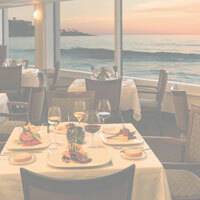 Please peruse our trusted reviews by recent guests of our award-winning San Diego restaurant to get inside information on our innovative seafood menu and breathtaking views of the surf and sand that has been an iconic San Diego dining tradition for over 77 years.